Finding inspiration through visual art comes naturally to Sarah Gibson. As a kid growing up outside Atlanta, GA, Gibson played with finger paint, watercolors, and charcoals nearly every day. Her mother, an educator and self-taught painter, encouraged creativity in her daughter from an early age, giving her ample access to art supplies and, in time, weekly piano lessons. Today the 32-year-old composer and pianist makes her home in the Hollywood neighborhood of Los Angeles, where she lives with her screenwriter husband and their dog, Barley. She describes her life as “super busy and fun,” packed with composing, teaching, rehearsing, and performing. At the University of Southern California, where she received both her master’s degree and PhD in composition, Gibson is now on faculty, a professor of theory and analysis. 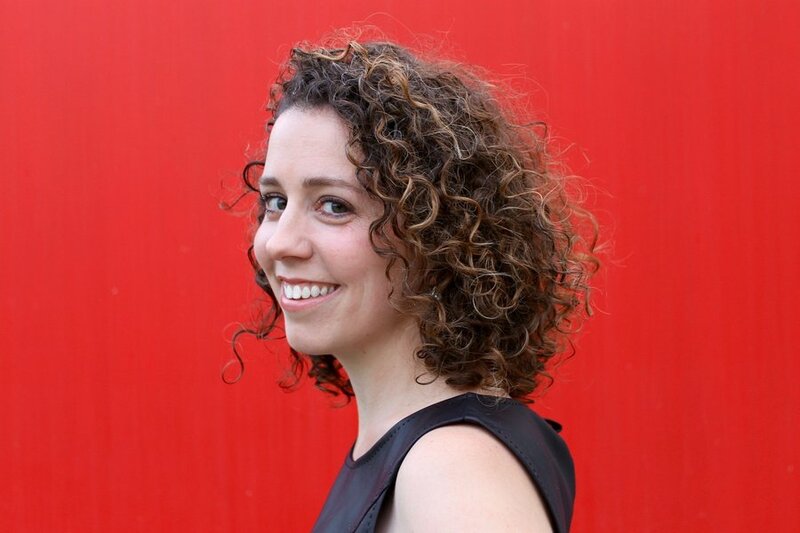 As lead teaching artist for the Los Angeles Philharmonic’s Nancy and Barry Sanders Composer Fellowship Program, she spends her Saturdays tutoring high school students in composition alongside fellow USC faculty member Andrew Norman, the program’s artistic director. 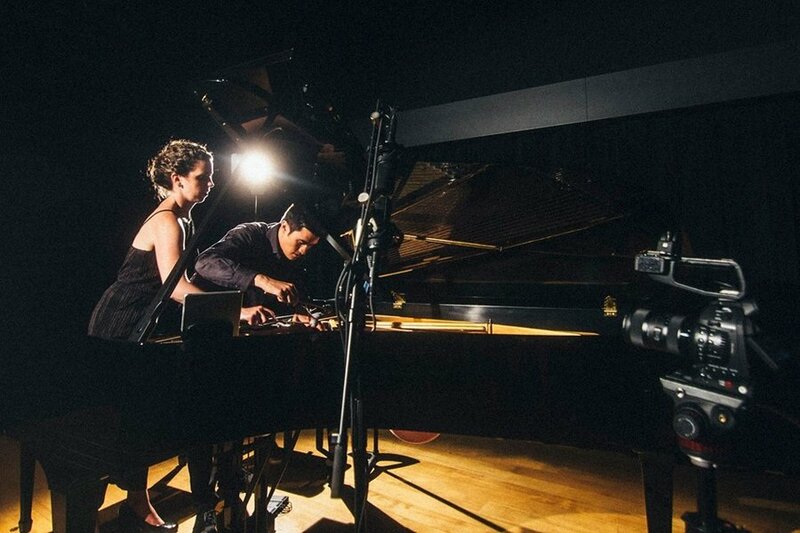 An active and enthusiastic performer of new music, Gibson is one half of the much-lauded new music piano duo HOCKET. In addition to composing for HOCKET, she has created works for the Aspen Summer Music Festival and School, the Tanglewood Music Center, L.A. Signal lab, and others. This season, Gibson is also the “Sound Investment” composer for the Los Angeles Chamber Orchestra, which will premiere a commissioned piece, warp & weft, January 26 and 27. Gibson’s piece will be conducted by Peter Oundjian, and shares a program with Ruth Crawford Seeger’s Andante for Strings, a Mozart piano concerto, and Beethoven’s Fifth Symphony. We caught up with Gibson by phone to discuss her new piece, her creative process, and what it’s like to be a “Sound Investment” composer. NATIONAL SAWDUST LOG: When did you start playing piano, and when did you start composing? SARAH GIBSON: I started begging my parents for piano lessons when I was about four or five. We had a little dinky upright in the basement, and I always wanted to play on it. My parents made me wait until I was seven to take lessons. Neither of my parents are musicians, but I’ve been fortunate in that they’ve always been really supportive. My mom is a self-taught artist, so she’s very creative and I think she was always excited to see me do creative things and to help cultivate that. I fooled my first piano teacher into believing I could read music for about two years [laughs]. I was getting through my repertoire by just asking my teacher to play it for me first and copying her – and then I switched piano teachers, and that teacher figured out that I only knew where middle C was, so I had to kind of start over. But the cool thing about that very first piano teacher was that she recognized that I was making stuff up, and so she told my parents to record me anytime they heard me playing something that wasn’t what I was supposed to be practicing. They had a little tape recorder in the living room and my mom would just go over and press record. And then later my teacher would help me write it down. So that was really amazing. Do you still have those recordings? I’m sure my mom has them somewhere! It would be really fun to listen to them, although I’d also have to also find a tape player. Maybe they’re all in the same place in my parent’s basement [laughs]. Did you take composition lessons as kid? There was this really cool little program at the public school I attended… actually, it was part of the national Parent Teacher’s Association. It was called “Reflections,” and it was a creative arts program with divisions in photography, visual art, writing, and composition. It was a little competition they’d have each year that started at the school, and then went to county, then to state and potentially to nationals. From the time I was seven until I graduated from high school, I entered the program every year with a new composition. When I was in high school I studied with a piano teacher at Emory University in Atlanta, and she set me up with a composition teacher at George State University. So I started taking official composition lessons my junior year of high school. So you knew when you went to Indiana University for your undergraduate degree that you wanted to compose? Yes: as a senior in high school, I decided that I wanted to double major in piano and composition. Honestly, if you’d asked me when I was five what I wanted to do when I grew up, I would’ve said “write music for Disney movies.” Of course, that has changed a little bit [laughs], but the fact that I am composing still is pretty fun when I think about that little five-year-old vision. Well, you live in Los Angeles now, not far from the Disney Studios in Burbank, so you could potentially still make that dream come true. Exactly! When I was a kid, I totally wrote a fan girl letter to Elton John after The Lion King, telling him I wanted to write music for Disney movies. The tunes, man… they are good tunes. In all seriousness, your husband is a screenwriter. Have you ever considered scoring films? No is the short answer. I’m so attracted to live music. That’s what inspires me most as a performer and a composer. I also just don’t know the technology that I would need to be a successful film composer. But I’ve always told my husband that whenever he has a show on the air, I might want to write the opening credits, because I could write a theme, and I’d love to do that with him. As a performer, your focus has been on new music. Do you recall when you first fell in love with new music? I was a pianist in the Atlanta Symphony Youth Orchestra from my sophomore year through my senior year of high school, and it was amazing from multiple perspectives. I might put quotes around what qualifies as “new music,” because when I was in high school I’m sure I thought Stravinsky was incredibly new. As a pianist in that orchestra, it was mostly the 20th- and 21st-century works that had piano in them, so I would go to rehearsal and we would play music by Paul Creston or Stravinsky or Libby Larsen. So that is where I was like, “Oh, I get to be included because this is more modern.” It was such a great experience, literally sitting in the middle of an orchestra. So I was thinking about orchestration and what sounded cool. And then the very first composer that I met was Jennifer Higdon, who has a strong relationship with the Atlanta Symphony. They were playing her piece Blue Cathedral, and everyone in the youth orchestra got to go to the concert for free, so I heard that piece. I loved it. And then she came and spoke with the youth orchestra, and that was monumentally impactful for me. I remember asking her questions. I probably asked way too many questions! I asked her what it was like to teach composition, and how she got her pieces played by an orchestra. I think just seeing a living, breathing composer – and also a woman – I think that was really the moment where I knew that I liked what I was playing, I knew I liked her, and I knew I liked writing for people I was playing with. How do you think your experience as a performer of new music informs your process as a composer? Oh my gosh, so much! Being in HOCKET, I’ve always looked at the music from both sides of the stand, and I’ve always understood how the score is a performer’s first impression of a composer. It’s so important to me to understand and figure out how to make my music communicate through the score, so that it communicates clearly even if I can’t be there. That goes down to the nitty-gritty of notation, but also descriptive words and how you produce the part. Email or in-person communication with players, forming some sort of a relationship, is so important. I also think that the times I’ve enjoyed being both a performer and a composer the most are in workshops. I think that performers can feel so involved and validated and important when a composer really listens to what they have to say about the music. And that doesn’t necessarily mean only through words; it can just be how they’re playing. Opening a dialogue about a passage and figuring out what a player needs is so important for both people in that equation. These days I’m digesting so much new music in HOCKET. My partner in the duo, Thomas Kotcheff, is also a composer. We talk so much about all aspects of the music that we’re playing. To be able to have that sort of relationship with another composer/performer, where we really are dissecting what we’re doing, is so exciting and so influential. It gets me thinking a lot, and it’s very inspiring. Do you write a lot of music for HOCKET? Yeah… I guess you could say HOCKET is in the style of Steve Reich’s band or the Philip Glass Ensemble. We even talk about it like a rock band, because the really fun part of being in a rock band is that you write songs for your band and then you get to play them. Thomas and I know each other’s playing very well, so it’s really fun to write for each other. I’ve written two pieces for us, and Thomas has written two pieces for us. I think potentially in the next season we’ll each be writing a piece for us again. I think that whenever we’re writing for our group, we’re both really trying to think of something that is at once totally us, and also something that we haven’t seen before. It’s really cool, too, because we just spitball with each other so much, bringing in little excerpts and goofing around on them, trying to figure out what something that we’re writing can become. It is a really great process for me and I think both of us. Tell us about your LACO piece. What was the inspiration for warp & weft? I’m really inspired by artwork. Often, when I’m in a rut compositionally, I just go to a museum. I think that definitely comes form my mom being a painter. So I found this artist named Miriam Schapiro. In the 1970s she and another artist, Melissa Meyer, came up with this term “femmage,” which represents all of the under-appreciated arts that were normally attributed to women like sewing, decoupage, or collage. She started using those techniques in her paintings—she would sew things into her artwork or decoupage them. I was really attracted to this idea of both representing women and also bringing attention to something – both a gender and techniques – that were underrepresented. A lot of these techniques I think can have a very musical relationship as well. Think of a single thread. I’m a very melodically driven composer. I like tunes in my music. So thinking of a tune as a thread came naturally to me. Sometimes I’m inspired by a specific artwork, but in this case it was more like an ideology, and just a respect for Schapiro’s artwork in general. Warp and weft are weaving terms. On a loom, the warp is the yarn that goes basically from your body to the loom, so kind of flat across. The weft is what goes over/under. So for me, the warp signifies vertical harmonies and chords, and then the weft, not surprisingly, is horizontal melody. Structurally, the piece is defined by vertical sections versus horizontal sections. There are chords that start big and then dissipate, and then there is the growth of a melody. How does that work out in terms of instrumentation and orchestration? Who is playing the warp and who plays the weft? There is one chord progression, and one melody, both of which grow throughout the piece. With the chords, the growth is mostly in the orchestration. The melody starts in the strings and ends in the strings. At the beginning of the piece it’s a melody that kind of keeps trying to get started and not quite getting anywhere. By the end, the melody ends up being over a minute long, one continuous thought in the strings. LACO workshopped warp & weft last October. How much did the piece change after that? Wildly! I was actually really happy with that first reading. First of all, when I heard it played by a fantastic orchestra, the piece sounded different than I expected to some degree. During that reading I heard the potential of some things that I had tried. So there were things I wanted to expand. One of the largest things I realized is that music can go by in an instant. There were some places that just needed to breath. I wanted to give more space for certain gestures to continue getting started before I took the audience’s ear away from it. There were a lot of colors I really liked, and I just wanted to make sure people had time to process—that I even had time to process. I had been living with this music for over a year, so if it felt like it went by too quickly for me, I can’t imagine how quickly it would feel to anybody outside of me. When I went into the reading, the piece was around 10 minutes long; now it is 13 minutes. What is the experience of being a LACO “Sound Investment” composer like? There are four salons throughout the scope of the commissioning season, which is an amazing aspect of this program. All of the “Sound Investors” [individuals who financially support the commission] are invited to these salons. They get to watch and listen to the process as it happens. The first salon was kind of a meet-and-greet between the investors and me. I played some music that I’d already written, and I performed a little bit with my duo. Then I talked about my hopes for this piece. For the second salon, the Sound Investors got to go to the reading. That really gives them so much better of an understanding of what they’re in for at the premiere. At the third salon I was able to select a quartet – I chose a string trio and oboe – and I was able to try out even more things, to test some of my edits before the final score was due, and get feedback from the Investors, who ask great questions. For the fourth salon, they’ll attend the dress rehearsal. I’m really used to talking shop with the people I’m playing with, talking about what we’re doing with phrases, what we’re doing musically. But it’s rare for me to verbalize my compositional process. It was really interesting throughout this whole process to have these opportunities to do that. It kind of kept me honest. I spoke about some of my original ideas for the piece and 30 people heard it. So I wasn’t able to back away and do something else when it got scary. I had to stick to my original idea, like, ‘Okay, I guess that’s what I’m doing!’ I think I actually learned a lot about my own compositional process through these salons. Usually one or two individuals commission a piece. Here it is a whole family with different questions and energies and excitements. I feel like I know so m any different types of listeners for new music now. They are people who are so engaged, so interested in new music, but they might not play—I think the majority of them don’t play. So that is a fascinating take to get, and a very valuable one. So Happy for Sarah, she is a rare talent from a rare and amazing family. Will attend a concert for sure.